PayTM is the biggest online payments platform in India. Recently PayTM claims that to have over 150 million users. Although PayTM App and Site offers a very easy and user-friendly interface to use. Still, there are many newbies may still find it confusing to use PayTM. In the latest update of the app now it is available in 10 More languages. 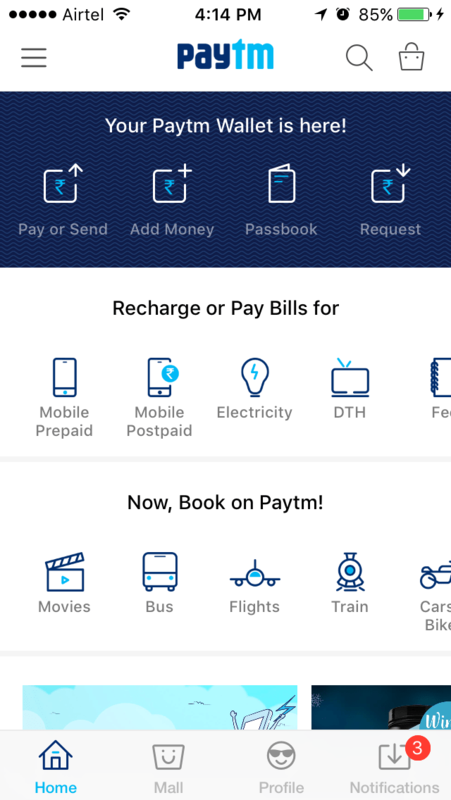 This article talks all about of what is Paytm, how Paytm works, and what you can do with it, how to transfer money to Paytm and Bank Account and much more things you can do with just one app “PayTM”? PayTM is a digital payments platform. This platform allows you to transfer money or pay merchants through the wallet online banking, debit cards, and credit cards. By using the PayTM wallet money you can pay for many goods without cash. The Paytm term is an acronym for “Pay Through Mobile”. 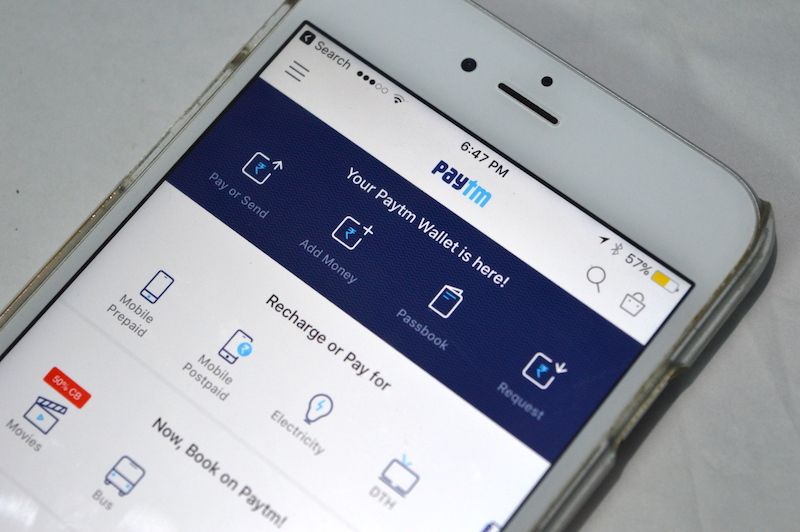 Paytm was founded by Vijay Shekhar Sharma in 2010 as a prepaid mobile recharge website. Later on, it became the most popular Payment platform in India. Over the time PayTM introduces the App for all the platform Android, iOS, and Windows. On the Android platform, Paytm will be available in Hindi, Tamil, Telugu, Gujarati, Marathi, Bengali, Kannada, Malayalam, Oriya and Punjabi. The roll-out for Apple handset users will happen soon after. Pay online bills of any Postpaid connection, Water, Electricity, Eduction, Metro and Gas etc. Book tickets for buses, trains, flights, movies, hotel rooms, etc. Pay for Uber cab rides. 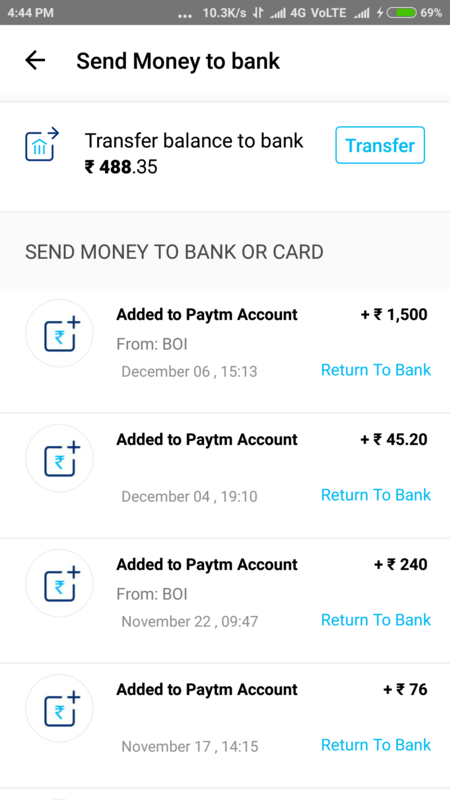 Paytm also allows you to send money to other people’s Paytm wallets or to bank accounts. 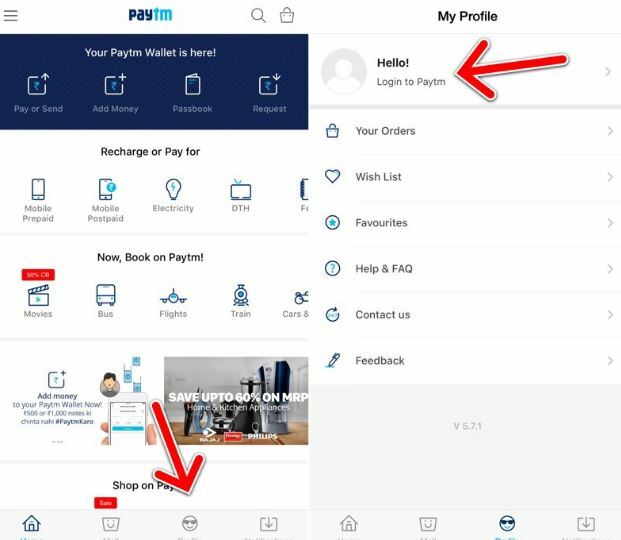 Step 1: Goto Paytm.com or you can download the Paytm app also. You can also create the account on website and login in your app it’s the same and vice versa also. Click on the “Sign up” and a new window will appear. Here you need to fill all the information. A valid Number, which is active at that time. Now click on the “Create My Paytm account”. You will receive an OTP on your mobile number, enter that in OTP section. Fill your Frist Name and Last Name, choose male/female. By the clicking on the “Create Your Paytm Wallet” your Paytm is activated. 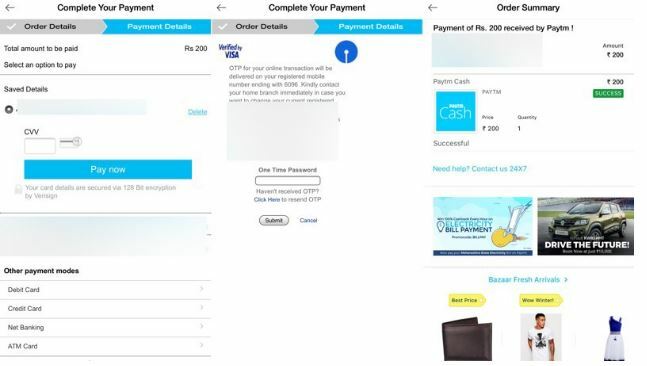 There you go now you have successfully created the Paytm account look as simple as. 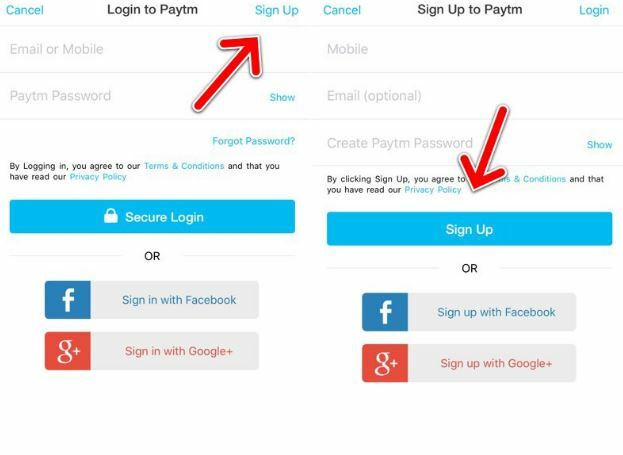 Now take a look how you can create your PayTM account on Mobile app. 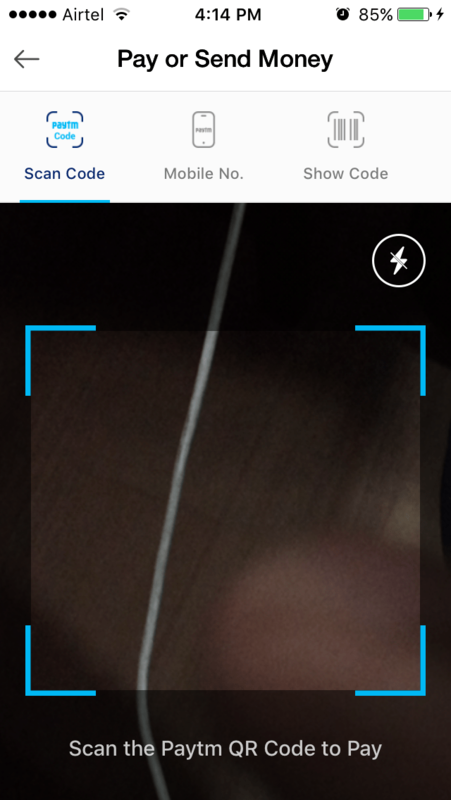 Step 1: First, Download the Paytm App() Open the Paytm app and tap on the “Profile” tab. Tap on “Hello! Login to Paytm” section on the top. If you have already created the account then you can Directly Log in using your Mobile Number or Email address and Password. Tap on “Sign up” on the top-right. Now enter your phone number and email address, password. Tap on “Sign up“. 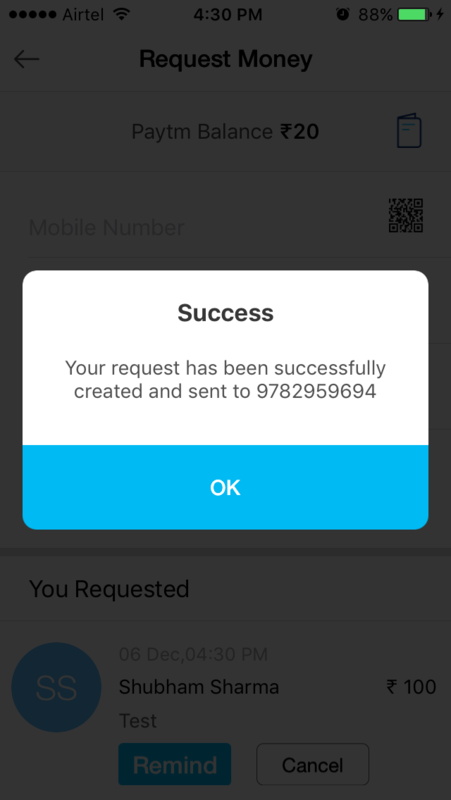 Step 2: Now an OTP will send it by the Paytm to verify the Phone Number you have entered. Enter that OTP and now your wallet has been activated. Now do all the transaction through Paytm wallet. Step 1: Open the App and on the home screen of Paytm Apptap on “Add Money“. Step 2: Enter the amount and tap on “Add Money“. If this is your first time as it is you have to use your Debit card, Credit card or net banking to add the money to Paytm wallet. Tap on the suitable method for you and fill all the details. Once it has done you will receive a receipt of verification. Now you have successfully added the Money into your Paytm wallet. Step 1: From the home screen, tap on “Pay/Send”. 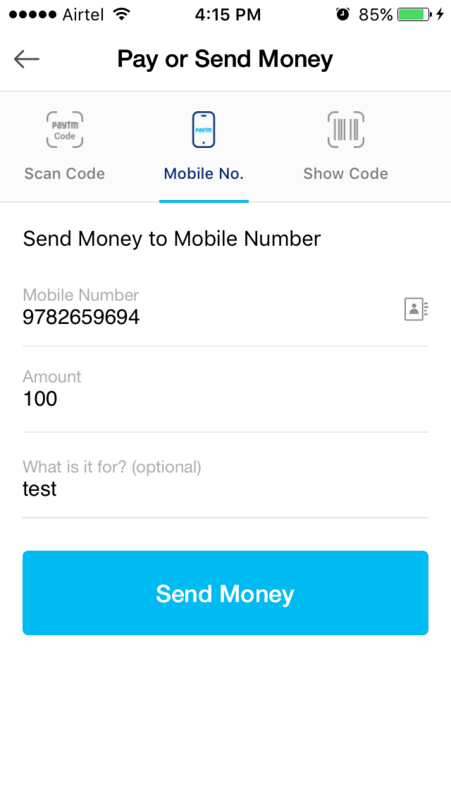 Now you will two options for sending the money the QR code or mobile number. If you have the QR code of the merchant then scan it otherwise enter the phone number of that. Enter the amount and purpose of that for just remember, why you have sent the money. Now tap on “Send money“. 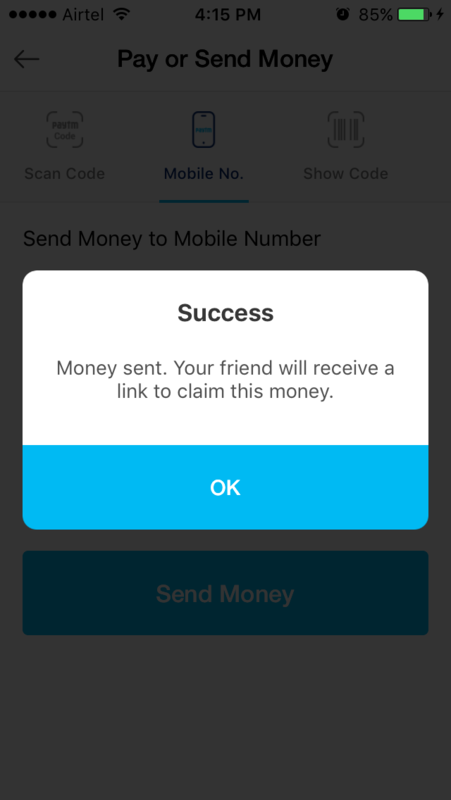 Step 2: You’ll get a confirmation of sending the money. The receiving person will get an SMS of the money they’ve received. Step 3: If you wanted to see your all transactions then go to the home screen, tap on “Passbook”. This Passbook is the same as your bank passbook the difference is this is Digital and other is Physical. Here you see 4 options “All”, “Paid”, “Received”, and “Added”. You can check anytime your all transaction on here. 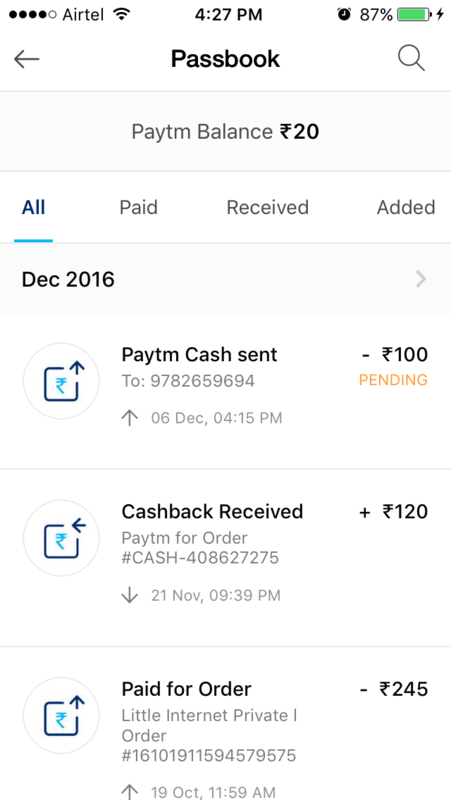 This is all about sending money if you want to receive money or due to demonetization your customer don’t have cash to pay you then you can also request them to pay the money by Paytm. Due to the democratization of the money, no one is accepting 500-1000 old currency. So in case if you stuck somewhere in the market and running out of cash so, you can also request money from your friend. Yes, you heard right by using this service you request will be sent as a notification to your friend. He/she can help you out. Step 1: From the Home Screen of the App tap on “Request”. Now enter the number of the person, whom you want to send the request for money as a notification. Enter the amount and a remark also. Tap on “Request Money”. Now a notification will be sent to that person for the money. There are two ways, head towards to the Home screen off the app and go to “Request” and enter the phone number, amount, and remark for this translation. Another is, if you didn’t want to share your number with anyone then you can also receive your payment by QR code. 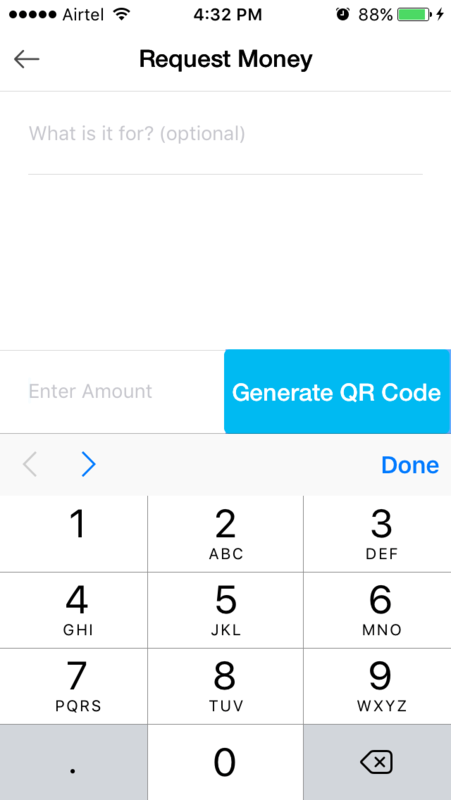 On the same Request page, in the right side of the “Mobile Number” you will see a QR small “QR”, tap on that and now tap on “Generate QR Code” it will show your “QR” code. Now share it with anyone. Now your customer will only need to scan that QR code and enter the amount directly. You will receive the payment in your Paytm account/wallet. 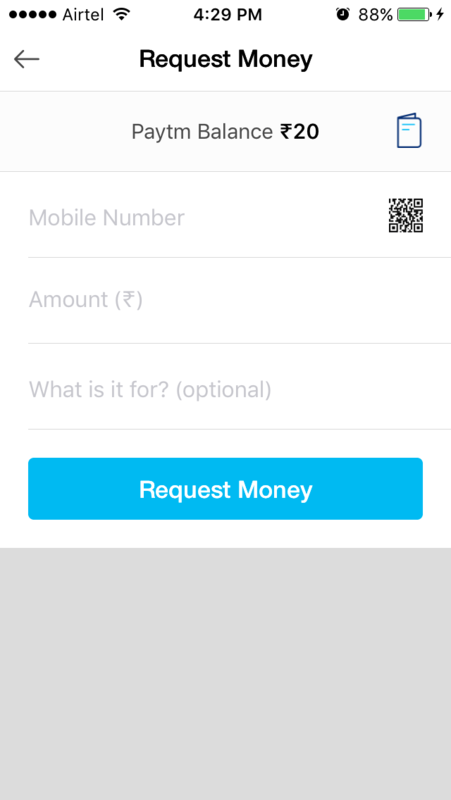 Now you know how you can Add, transfer, Request, and PoS of Paytm. If you want to transfer you Paytm wallet money into your Bank Account, let’s take a look. Step 1: From the home screen of the App tap “Passbook”, her you will see all your payments you have made and Balance also. On the right below the wallet balance, you see “Send Money to Bank” tap on that. 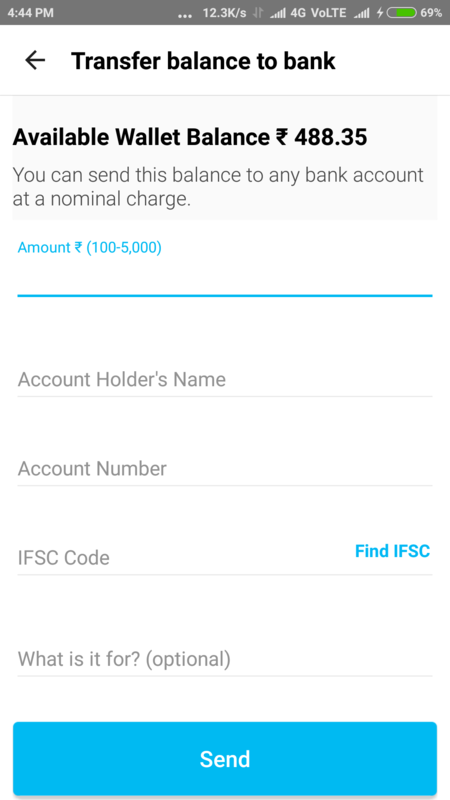 Step 2: Now again tap on “Transfer”, Enter the amount b/w 100-5,000, Account Holder’s Name, Account Name, IFSC Code, and What is it for. And Tap On “Send” if you have the money in your Paytm wallet then it’s Okey. Otherwise, you have to add money into your Paytm in a wallet. There is a thing you need to know Paytm is not charging any additional charges for the money transfer into your bank account till 31st December 2016. After 31st may be they charge for that we can’t say. 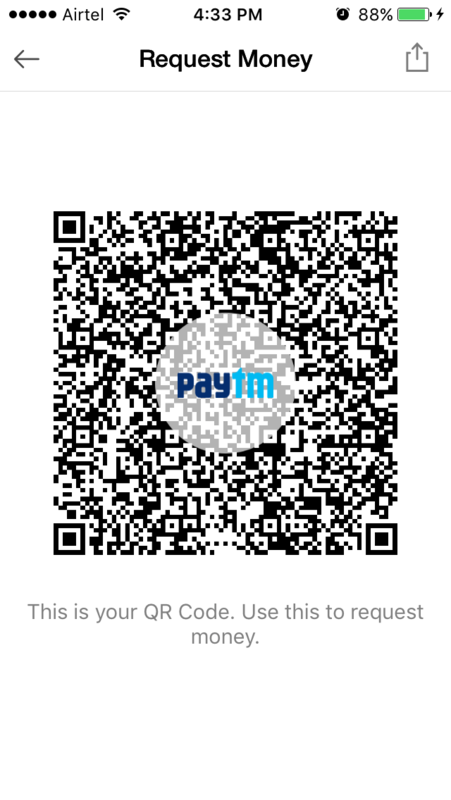 If you have any issue related to anything on PayTM like any payment issue or anything related to any order. You can contact to PayTM customer service with your order id, they will sort out your problem. 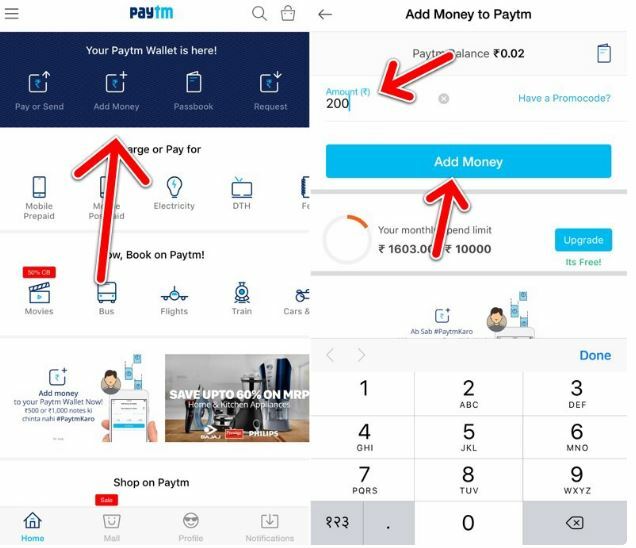 Guys, now you know How To Use Paytm App, Add Money In Wallet & Transfer Balance. 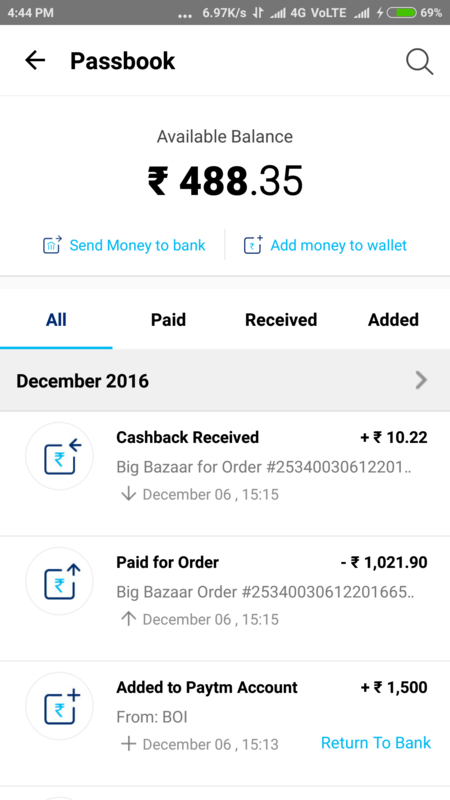 This not only can Paytm do, there is a lot more things you can do with you Paytm wallet. You can do Recharge, bill Payment, Train Booking, Hotel, Cab, Movie tickets booking also. Paytm is a growing e-commerce platform also. So try Paytm app once and let us know your experience and if you have any query then feel free to ask through comment section.